Using a power of attorney, you can legally authorize another person, who is known as an agent, to act on your behalf. Under this arrangement, you are known as the principal. Typically, a principal executes a power of attorney so the agent can act for the principal regarding healthcare or financial matters. 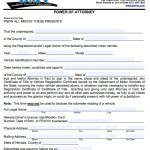 A power of attorney is easy to create. 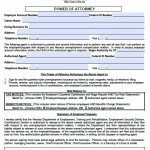 You simply need to obtain a form, indicate which powers you want to grant, name your agent, and sign and date the form. In Nevada, you must either have two witnesses who personally know the principal sign the document, or you must have it notarized. These documents can be flexible as well. You can have one go into effect only if you become incompetent (called a “springing” power of attorney), or you can make one effective only for a particular duration, for example, to cover a period where you will be away from your affairs. 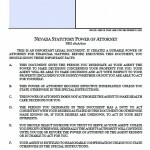 If you would like to view the laws in Nevada you may view the Uniform Power of Attorney Act. 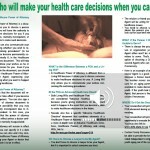 Read the informational brochure on how to fill out the document.